With Hannaford Gone. . .
Can Corbella be far behind ? As the CanWest Global empire sinks into its well-earned sunset many of its employees –including writers and editors - must be scrambling for new jobs. Living on the edge of being out on the street isn’t fun and it’s much worse when you are actually out on the street. Nigel Hannaford, a pedantic, boring, extreme right wing, politically conservative former editorial writer and columnist who began imparting his antiquated views on Calgary Herald readers in 1999 seemed to be ahead of the pack in testing the waters for more secure employment. Beginning in 2004 when the Harper government took office Hannaford consistently fawned over it, doted on it, and caressed it, while shouting loud huzzahs of approval at each and every of its pronouncements and actions – despite its screw-ups, meanness, lies, and deceits. Anybody reading his tiresome columns could be forgiven if they had concluded that Hannaford was looking to Harper for new and more secure work. 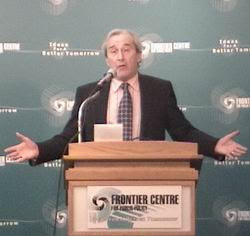 Well, I doubt that being in the real world is hanging out – as Corbella does - with the Greed is Good crowd at the Fraser Institute and the co-sponsors of the forthcoming Sarah Palin love-fest like Craig Chandler and the Progressive Group for Independent Business. But she is probably right thinking that it is Harper’s type that gets under people’s skin when he seeks prorogation. I’m speaking of the petty, mean-spirited type that indulges in the politics of personal destruction, assassinates the characters of people who get in their way, and who asks for prorogation twice in one year to keep the Canadian people in the dark and to save their own political skin. I mean, people like that have their detractors, non? In her defence of Harper Corbella then opts for one of her well-worn diversionary tactics. She brings up the red (no pun intended) herring of Bob Rae as Premier of Ontario. This is a device she has used many times before. Bob, she says, prorogued the Ontario legislature three times in five years, and then goes on to castigate his administration for its various misdeeds. Poor Bob. Corbella seems to be fixated on him, even though it is almost a generation since he was in power. The government of Premier Bob Rae is old news and few people save for the Harper fawners and apologists even talk about it these days. There may be quibblers as to my definition of ‘putsch’ in that some will say Harper did not attempt to overthrow a government. I say that if you choke off funding for opposition parties you are trying to overthrow government as Canadians have always known it. Corbella does have a moment – as even the most partisan of people like her do from time to time – of honest reflection. She calls Harper’s announcement of prorogation on December 30 “a huge miscalculation,” “bordering on disgraceful,” and refers to “Harper’s Machiavellian machinations.” Alas like Dr. Strangelove, after a moment of lucidity she quickly slips back into her normal uber partisan Conservative mode – saying that Harper should come clean with all of the info on the Afghan detainee issue “and let the Liberals come to the defence of Taliban murderers who were having ‘troubles sleeping because of stress’ while in prison.” Sound familiar? It could have been written by Harper himself. Her column then deteriorates into pure babble with a ridiculous feeble defence of Harper’s action arguing that prorogation saved taxpayers’ money because MPs did not have to fly back to Ottawa from their ridings and would not receive extra pay because the committees of which they were members were not sitting. Her closing thoughts reflect the rah-rah highly partisan Harperite that she is as she advances the proposition that prorogation is not such a bad thing because question period is vulgar, and that the bitching about prorogation is because Liberals feel entitled to govern. So what are we to make of all of that? Surely, the cowtown has produced no greater Harper cheerleader than Corbella, unless it is Nigel Hannaford. From day one she and Hannaford have been devoted to the Harper cause. They have been loyal and faithful through thick and thin whether their hero was mean, petty, deceitful, incompetent or all of the foregoing at once. If there is a place for Hannaford amongst the flim-flam artistes who write prime ministerial bafflegab for the masses, surely there must be a place for Corbella. By God, she’s earned it! Small quibble. "... you (referring to Harper) are trying to overthrow government as Canadians have always known it." As I see it, Canadians elected every single member of parliament to exercise her or his good judgment on their behalf and on behalf of all Canadians. Harper constantly goes out his way to ensure opposition members of parliament, backbench Conservatives and even cabinet ministers are kept from exercising their duties as responsible representatives of Canadians in the exercise of government. For those Canadians, he is constantly overthrowing government, plain and simple. Those unrepresented citizens of the Canadian democracy have no democracy therefore they have no government. Good Point Mike. Thanks for your comment. Darryl you are right on as usual. I haven't read anything that Corbella has ever written that had any basis in reality. Hannaford was just bad. It must be that a requirement of being a political writer for the Herald is that you have to be brain dead or completely delusional. Even Braid is showing signs of the disease. Thanks Tony - for your very erudite comment. But I've always had a soft spot in my heart for Braid. I've known him for a long time, and I know his instincts are good and honorable. And by the way Tony - You're Good! I look forward to reading your blog!